Dedication to producing high quality cheese, and the combination of traditional skills and an innovative interpretation of cheese-making techniques create a unique selection of cheeses crafted with the finest, freshest ingredients, each a wonderfully indulgent taste sensation. Our cheeses are served with pride in many of NZ's finest restaurants. They are also stocked on the shelves of many boutique food outlets. The retail Cheese Deli offers an exciting experience, watching the cheese manufacturing process, tasting the cheeses and purchasing the perfect accompaniment to your favourites. Popularity and demand has meant expansion. 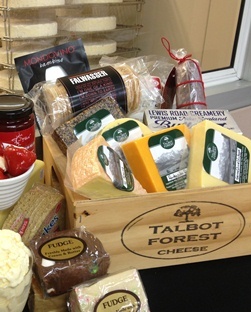 This means more customers can enjoy Talbot Forest cheese due to the elevated production levels. Talbot Forest Cheese is nestled in the picturesque town of Geraldine and is named after the local forest which in bygone days covered the very spot on which the factory stands. Many of the cheese varieties are named in honour of local geography.